Printed and produced by Ed. J. Burrow & Co., Ltd., 109, Kingsway, London, W.C.2 and Cheltenham. No year . + 74 + pp., 4to. Erratum slip. Printed on art paper, with numerous black and white photographic illustrations. In brown buckram quarter-binding, with paper boards printed in red and blue. Internally in fair condition, lightly aged and worn, with a leaf of advertisements lacking at the rear; in aged and worn binding. Calling Card with Autograph invitation on it to 'Mon cher docteur'. Samedi 16h 1/2' [no date]. 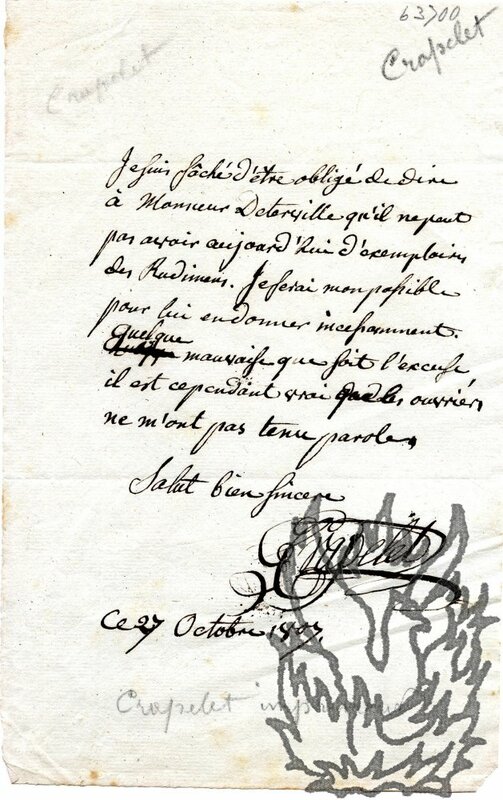 The calling card is roughly 6 x 9.5 cm, and reads 'Paul Baudry, | Membre de l'Institut. | 56, rue Notre Dame des Champs'. Around this Baudry has written 'Mon cher docteur | Venez s. v. p. voir ma petite avant votre déjeuner Vous me ferez plaisir. | Samedi 16h 1/2'. Autograph Letter Signed ('F. d'Olincourt.') to 'Monsieur Bance, aine, Editeur & Proprietaire, rue Saint-Denis, No. 271, a Paris.' In French. 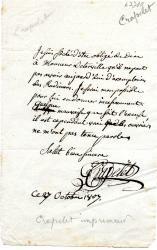 23 Janvier 1839; Bar-le-Duc. On elaborately printed letterhead. 4to: 2 pp. Eleven lines. Good, on lightly creased and discoloured paper. Column of printed advertisements in left-hand margin of first page, which is headed by a printed description of d'Olincourt's qualifications, enclosed in an engraving of a jumble of disparate items including a book-press, beehive, scientific instruments, laurel wreath and sailing mast. He has begun to publish an 'immense ouvrage d'architecture', and he hopes Bance will subscribe for a number of copies which he will be able to sell 'chez vos clients'. Keepsake, limited to two hundred copies, with signed illustration of 'L'abbaye en 1368' by Beaudouin. Beautifully printed bifolium on thick wove paper. Dimensions of leaf roughly thirteen inches by ten; dimensions of illustration roughly nine and a half inches by eight. Tissue guard. Recto of first leaf and verso of second blank. Letterpress on verso of first leaf reads 'Fernand De Nobele, libraire pres St-Germain-des-Pres, vous adresse ses meilleurs voeux pour l'annee 1969. | [L'abbaye en 1368]'. Illustration signed at foot 'Josephine Beaudouin', with the limitation '190/200'. For De Nobele - President of ILAB between 1965 and 1967 - see Anthony Rota's 'Books in the Blood' (2002). Autograph Letter Signed to 'G Remington Esq'. Journalist and musical critic (1806-79), Paris newspaper correspondent, 1839-44, who sent dispatches by pigeon. One page, 12mo. In poor condition: grubby and heavily stained. 'Dear Sir | I have been abroad or I would have replied to your note ere this. I will be at home until Noon next Monday. | Yours faithfully | [signed] | C J Gruneisen'.